Food is one of life’s greatest pleasures. 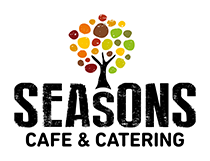 At Season’s, we believe that the tastiest, freshest food is local and seasonal. We want you to enjoy the changes in the seasons and what they bring to our table through the food we produce. Our fresh ingredients allow us to create simple, honest menus which reflect the quality of our produce. Each of our locations offers a unique range of freshly made dishes as well as ready-to-go meals, lovingly prepared by our dedicated team. Without love, it’s just coffee. We understand that from the first cup that gets you going to that afternoon pick-me-up, coffee is more than just a beverage. That’s why we hand pick a unique blend of beans for each of our stores, supplied by a local, family-run business right here in Geelong. We pour a whole lot of love into every cup of Season’s coffee and hope you enjoy our ‘Joe’ as much as we do! 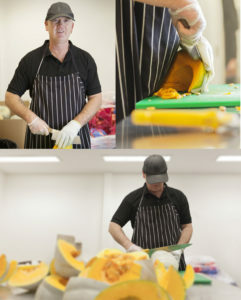 Each day in Karingal St Laurence’s commercial catering kitchen, Adrian moves at pace through a pallet of pumpkins, chopping up to three tonne per week to fill commercial orders received from hospitals and other businesses in the Barwon region of Victoria. There is a huge volume of vegetables to get through and Adrian does it without ever being able to see the pumpkin or his knife. Born with retinitis pigmentosa, a hereditary degenerative eye condition, Adrian wears a knife glove to protect his hand while working, and after being in the processing kitchen for over a year, he feels confident with his culinary skills.